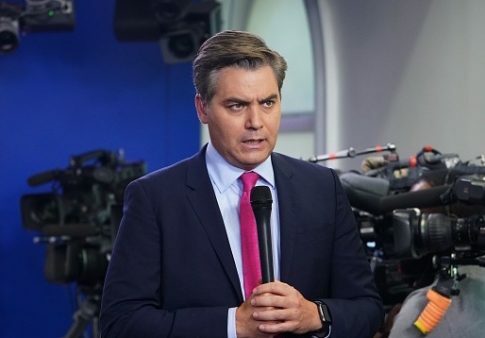 A federal judge ordered the White House Friday to temporarily restore the press pass of CNN correspondent Jim Acosta after yanking it from him following last week's contentious press conference. Judge Timothy J. Kelly, who was nominated by President Donald Trump, granted CNN’s motion for a temporary restraining order that would overturn the ban of Acosta from the White House grounds. The narrow ruling did not constitute a decision on the underlying lawsuit, but Kelly said it appeared Acosta was likely to be victorious in that case. It could be several months until a final decision is adjudicated. CNN said in a statement it was "gratified with this result and we look forward to a full resolution in the coming days. Our sincere thanks to all who have supported not just CNN, but a free, strong and independent American press." Press Secretary White House Sarah Huckabee Sanders said the White House would comply with the ruling but insisted "there must be decorum at the White House." Press Secretary Sarah Sanders says they will give Acosta back his hard pass, but insists, "There must be decorum at the White House." Alongside his attorney outside the U.S. District Court in Washington, a smiling Acosta thanked colleagues who supported him in the lawsuit and said, "Let's go back to work." He was the first reporter with a "hard pass" to enter the White House grounds to be banned. The ruling was a victory for CNN as it provided "emergency relief" for Acosta, whose lawyers said was having his rights violated with each passing hour, the Washington Post reports. Kelly's decision agreed with the argument that the ban of Acosta violated his Fifth Amendment due process rights. Kelly took care to say the ruling was "very limited" and left open the possibility that Acosta could again have his pass taken if the White House provided him due process, CNN reports. Acosta frequently receives criticism for showboating and editorializing in his questioning of Trump and Sanders. He drew Trump's ire last week when he asked aggressive questions about the migrant caravan and Russia, at one point accusing the president of demonizing immigrants. When told to sit down by Trump, Acosta refused to give up the microphone to a surprised White House intern. Trump snapped at him that he was a "rude, terrible person." Acosta's hand appeared to graze the intern's arm, leading Sanders to charge that he had placed "his hands on a young woman." He denied the charge, and CNN sued that same week. Fox News and 12 other news organizations jointly filed a brief in support of CNN, citing fears that such a precedent could affect any journalists in the future that angered the White House. UPDATE: 11:43 A.M.: This article was updated with Sanders' statement. This entry was posted in Politics and tagged CNN, Donald Trump, Jim Acosta, Media, White House. Bookmark the permalink.